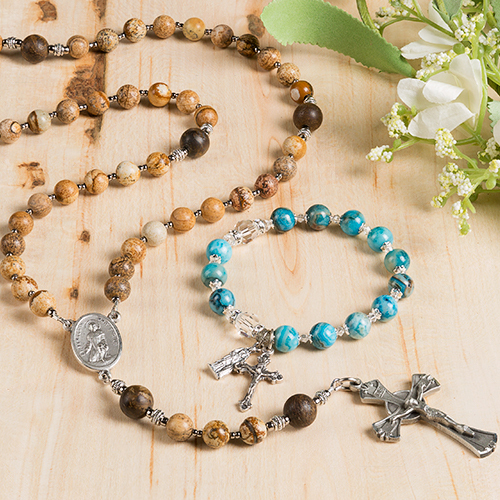 Captivating shades of earthy greens, blues, and golden browns unite in this stunning amazonite and bronze Immaculate Mary rosary. 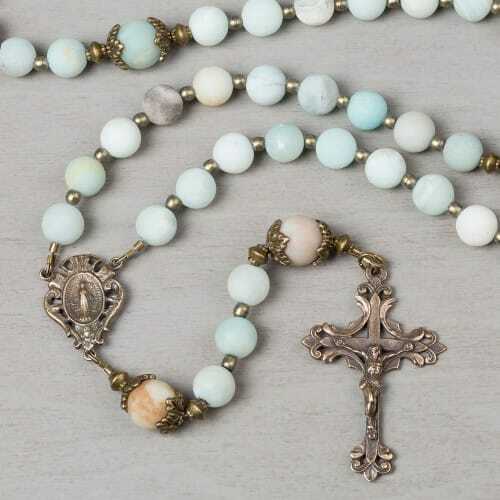 Smooth to the touch, the round beads have a soft feel and the colors provide a sense of calm while meditating on the Holy Mysteries of the rosary. The heirloom-quality rosary will be admired by the recipient for the beauty it exudes and the prayerful spirit it promotes. 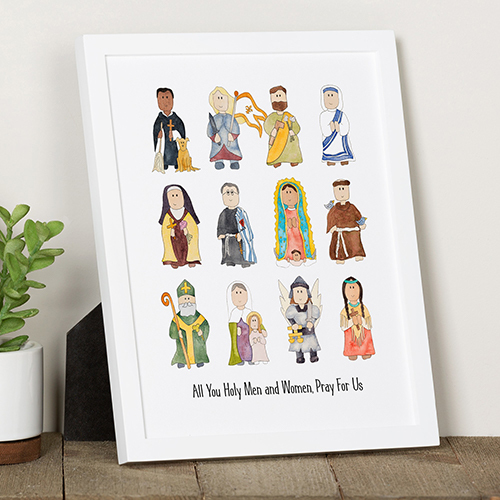 Unite your prayers with Mary as she intercedes to her Son on your behalf. 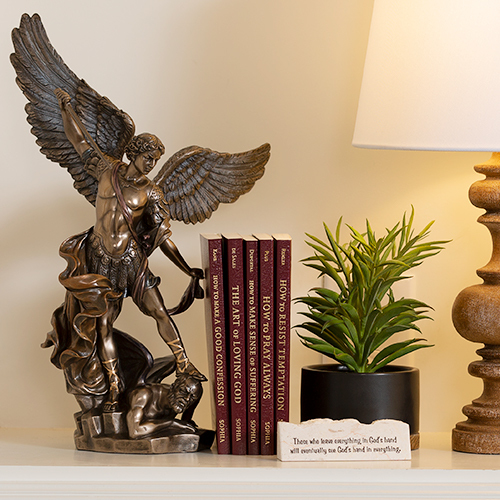 Handcrafted by our rosary designers and producers at The Catholic Company, and accompanied by a prayer card featuring the 20 mysteries of the rosary and which days to pray them. I love,love,love this beautiful Rosary. It has a heavy weight to it. And the beads have a soft color to them. I know that everyone should buy one. I love my beautiful new rosary! A wonderful addition to my collection. Very nice Rosary. Not sure of value (eyes of the beholder), but it is solidly built. After a few uses the wire stretched just right for bead movement and finger placement. Has quality and beauty, and will be my daily Rosary. Great shipping to Canada. Holy Mother Mary pray for us. I've been eyeing this rosary for a long time and decided to finally buy it. I collect rosaries and this is one of the most beautiful. I have been showing it to my family and friends and when they see it, they all take a big breath in and say that's beautiful. The picture doesn't do it justice. I love this Rosary! 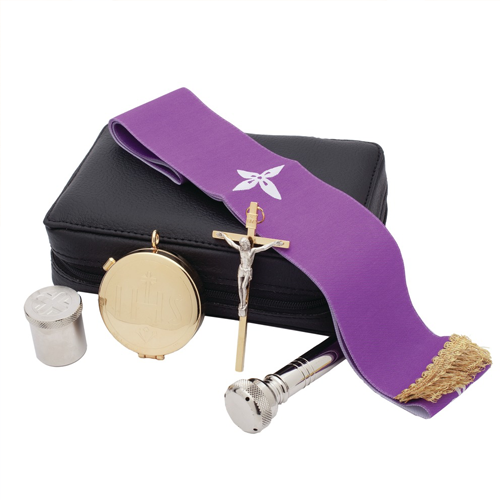 I Wish it came with a large size Rosary Pouch to keep it in. This Rosary is positively beautiful. The soft blue and creamy hues keep me tranquil. The interesting part is that the beads themselves are cold upon touch. They do warm up as you hold them. I purchased this rosary for myself. I love it. 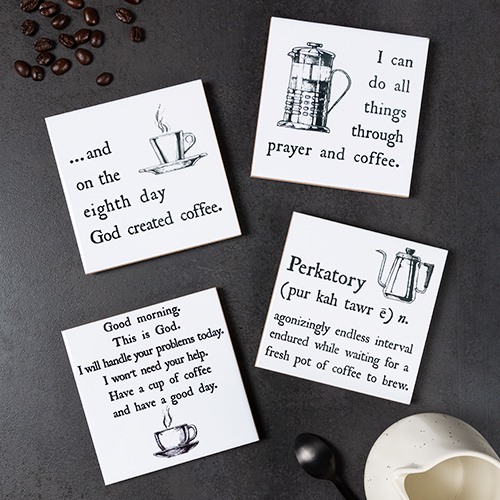 It would also make a beautiful gift. It is definitely an heirloom rosary. This is a rosary made from stones; I never had a rosary like this, the stone beads are cold at first touch, but warm up when I hold them. I love the soft colors of light blue and tan. Love to pray the mysteries on this rosary. I definitely would purchase it again. 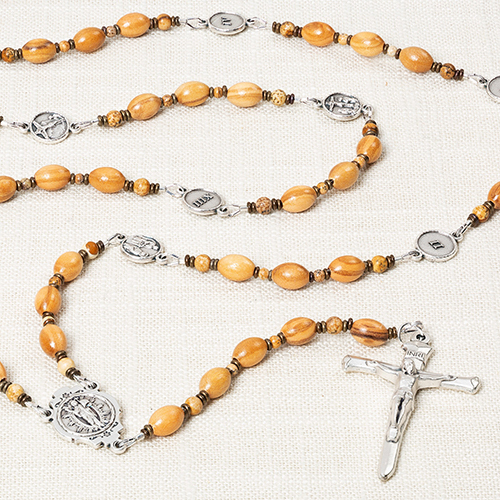 Very beautiful rosary-indeed heirloom quality. When I had it blessed by my pastor, he even commented on how beautiful a rosary. Wonderful stones and nice weight. Being strung on wire, it does not compress as much as chain links, but that is not an issue for me. 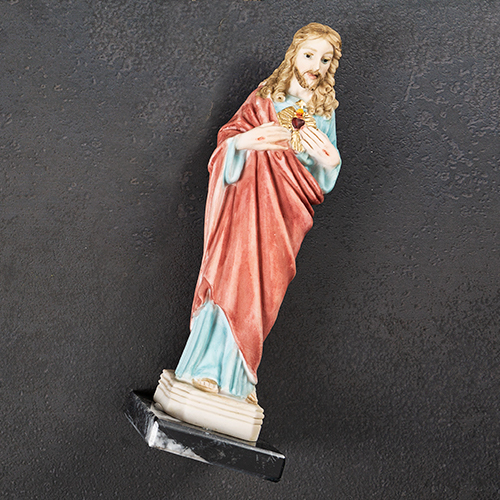 May not fit in a conventional rosary pouch. 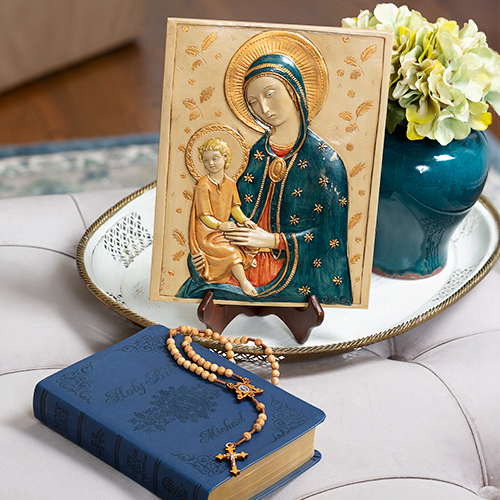 The Rosary is stunning, the colors are true to your onsite image, and the craftsmanship is outstanding. I was delighted my purchase, and will definitely order from you again. I own three other rosaries, but this one I bought especially for me...I love it, it perfect. Thank you for your beautiful web-site. I love this rosary. It's much more beautiful in hand. It's sturdy and a big size. The colors are so beautiful and the beads feel great. At first cool to the touch but then it warms as I say the rosary. 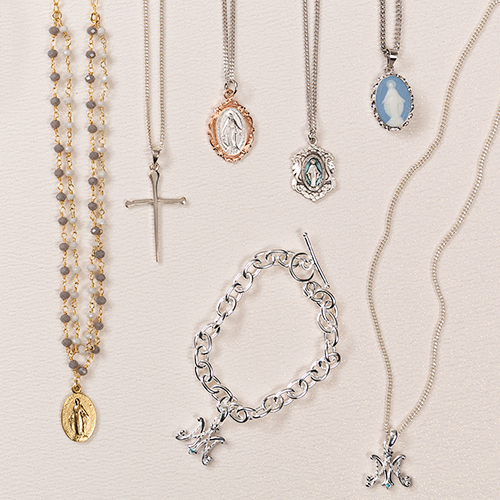 I love the Miraculous medal it has and the crucifix is lovely too. It was strung tightly but it lays better now that I've been using it daily. I'm very pleased with this purchase. This Rosary was a gift to myself. It's the first rosary that I ever picked for myself to purchase; all the other ones I have I either inherited or was given. I was so excited to find this unique rosary and I promptly ordered it. It is absolutely beautiful- the photos don't do it justice. The colors of the beads are so unique - celestial and of the earth. No two beads look exactly the same. Beads feel great in your hand. A fantastic purchase. 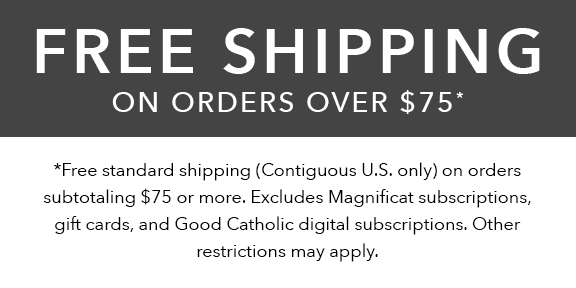 I would definitely recommend this rosary to you! The stone beads in shades of sea and sand are cool and smooth to the touch. The bead size of 8mm and 10mm allows for peaceful meditation without worry of losing your place. I fell in love with this rosary at first sight, it is more beautiful than pictured.